road to the beach (which is 1 block away) and is helpful for unloading groceries, loading and unloading luggage and items for day trips around the island. A screen door, an upgraded window in the bedroom and a patio door, all of which are lockable, provide a cool breeze which keeps the unit comfortable most of the time. There is an air conditioner in the living room and ceiling fans in the kitchen, living room and bedroom to supplement the breezes. The very private lanai has a garden view comprised of plumeria trees, a flowering hedge and an adjacent field filled with an abundance of green folliage. We have rented units in Kihei Alii Kai many times and love the size of the units (700 sq feet in the one-bedrooms plus a 150 sq ft lanai). We have viewed units in many of the surrounding properties and none can compare. The fully equipped kitchen is a pleasure to work in. It has been upgraded with maple cupboards, granite counters, and new flooring. A newly renovated bathroom with tub and shower is a beauty. The smooth-top stove has a self-clean oven and the microwave is over the stove. 2015 and 2016 saw us re-texture the walls , re-paint the living room, kitchen and halls, install new carpet in the living room and bedroom, replace the drapes, dishwasher, and air conditioner . Sleep in the luxury of a queen size Simmons Beautyrest pillowtop mattress in the bedroom and a new sofa bed in the living room which has a queen size deluxe spring-filled mattress with a pillowtop. The beautifully tiled lanai (porch) has a chaise lounge and a table and chairs and opens onto a lawn with a plumeria tree. Beach towels, beach chairs, a beach umbrella, and a cooler are provided. Long distance calls to Canada and the USA are free as is the wi-fi internet access. While car rental gives visitors the luxury of touring the island at your liesure, it can be expensive. If you would prefer an alternaitve mode of transportation, we can recommend the Maui Bus. Details for using the Maui Bus are available on-line and in the the Visitors Binder in our condo. Shuttle Services are avilable for getting to the condo from the airport in Kahului. 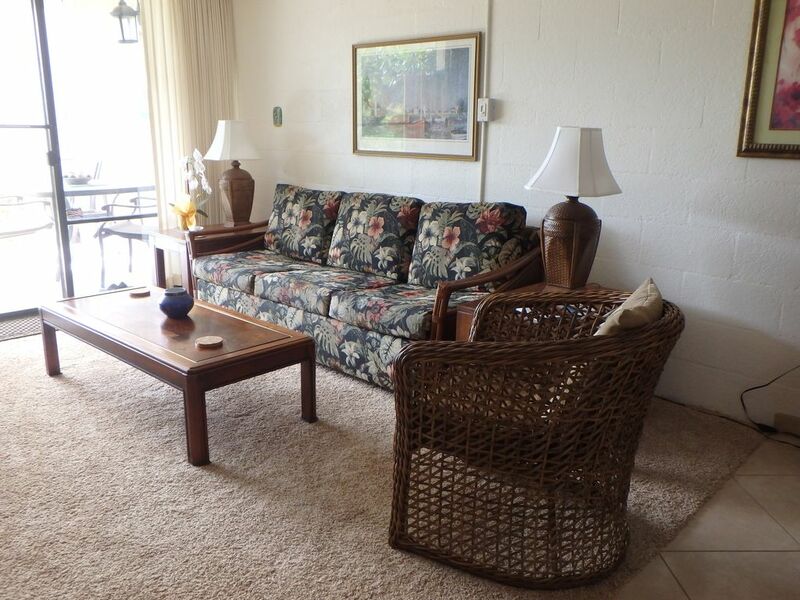 Rod and Lois have rented units in Kihei Alii Kai on many visits to Maui and always loved the spaciousness of the units and the closeness of the beach. Our family (children and grandchildren) spent Xmas 2010 at the complex and our son Brad got excited about having a winter retirement home in Maui in the future. So we casually started looking at property and the more we viewed, the more Kihei Alii Kai came out on top! When we found this ground floor, upgraded and private unit, with its perfect location in the complex, it sold itself! This is now our comfortable tropical home away from home. We hope that you will love it as we do, and that you will treat it as carefully as you would your own home. Enjoy! LOCATION! LOCATION! LOCATION! South Kihei has the best weather, most sun and three of the most popular beach parks in Hawaii. Unlike self-contained hotel resort settings, it has a folksy “village-like” atmosphere. You can walk to restaurants, shopping, beaches, a health-food store and internet café. There are six championship golf courses within 15 minutes and easy access to the Pi’ilani Highway for fast trips to other places on the island. Early morning on South Kihei Road is a jogger/walker's paradise. It is few minutes drive to central Kihei with three supermarkets (including Safeway), Longs Drug Store, hardware store, local theater productions and other shopping amenities. Landline phone with free long distance to the USA and Canada. Free WiFi. Living Room a/c plus ocean breezes keep the unit comforatble. Ceiling fans in the living room, kitchen and bedroom. Replacement bedroom windows are secure and private from most pedestrian traffic. hand towels, bath towels and beach towels. But, it's a few yards to the 8 steps which lead to the loading zone provides a better option. A full kitchen with up-graded cupboards, marble counters, tile floors, a recently purchased water heater, and a new dish washer. Adjoining dining area which seats 4 and is well lit with an overhead chandelier. Some in the unit many more in the complex office which is open 24/7. Lanai opens on to the lawn with plumeria tree and palm tree. This unit may not be suitable for kids 5 and under as the lanai is accessible to the grassed area which boarders on a vacant field which is on the other side of the hedge. Younger children would require constant supervision and there are some feral cats and chickens around. Large outdoor pool and spa with spacious pool deck for sunning. Plenty of chaise lounges. This was a great place to stay in Kihei. It was very clean, and had everything we needed for the week. We prepared our own food, and it was nice to find a fully stocked kitchen with all the kitchenware we needed. The beach is only about two blocks away, so we could just grab the beach chairs and beach towels (which are provided) and walk over without worrying about parking a car. If you love gelato and shave ice (make sure you get it with ice cream in the bottom),you will find both within a few minutes walk of the condo. You can pick some up and then stop at the beach to watch the sun set. Perfect! My family of 3 (13 y/o son) really enjoyed Brad’s place. The condo itself was very spacious and the lanai was very private – which was especially nice during such a busy time of the year (Christmas/New Year). The condo was well stocked and had everything that we needed for our 2 weeks. While the layout of the complex/parking can be a little confusing at first, the location of the complex was ideal – a short walk to so many amenities: Beach (Kam I is beautiful and has decent snorkeling right off the point too), ABC and a bunch of other great restaurants/bakeries. Brad was very responsive to any questions or inquiries that we had. We would definitely stay here again, although unfortunately he is unavailable on the dates we are planning our next visit. Thanks for the nice comments Carl. We enjoyed having you and your family as guests and would welcome you again in future. The place is great. Quick access to a beautiful beach and many shops and restaurants. The host was very supportive. Our vacation went as smoothly as possible. The condo is equipped with everything you can possibly need for a comfortable stay at your own private apartment. The Lanai is so peaceful in the evenings and mornings and yet you can see the ocean from the complex, that's how close it is to the beach, just across the street. Perfect location and close to stores, restaurants and one of the main roads connecting us to Wailea and Lahaina. Thank you so much for sharing your place with us! Location is great and unit was comfortable and roomy. Lots of supplies and well stocked cabinets with cooking and cleaning equipment. Lots of towels, sheets and bedding with a in unit washer and dryer. A very pleasant place to stay while vacationing in Maui! Highly recommended! Comfortable condo in a good location. We enjoyed our stay in this condo. Close proximity to a nice beach, there are a lot of shops and restaurants pretty close. Sunsets like a picture. Condo is well stocked with major necessities for having home away from home. Lanai gives the impression that condo extends further, which is very pleasant. There was a collection of beach toys, I wish there would be some sand toys. Adults and children like to build sand castles. Also, maybe a coat tree with some hangers to hang shirts that you do not want to put in the chest. These are the only two minor things that we would have modified. Otherwise it is a really nice place and we liked it a lot. Thank you for sharing it with us! I think the idea of a few sands toys is a good one and I’ll buy some next trip. I don’t want a coat tree as I want to limit the amount of stuff in the condo so it’s not cluttered. There are lots of hangers in the closet. I’m glad you enjoyed your stay.